Rent villas in South Pattaya, Pattaya with private pools. Book affordable holiday rentals that are near a beach and golf course. You can rent this entire resort, which is great if you are a large group of friends, a golf or wedding party. Baan Calypso boasts 7 spacious bedrooms, an amazing interior, and a pool terrace to die for, with custom lighting, loads of seating and lounging, BBQ area, and peaceful, green surroundings. This supremely positioned 5-bedroom home at Pratumnak Hill is just a 400 meter walk from the beach. Baan Chokdee is a 5 bedroom holiday home in a quiet and secure private estate. Located just 1km from the family friendly Jomtien Beach this recently refurbished villa offers comfort all the way. Set within what is one of the most peaceful locations of all our villas, The White House Huay Yai is a 7-bedroom villa that sleeps 14 adults. 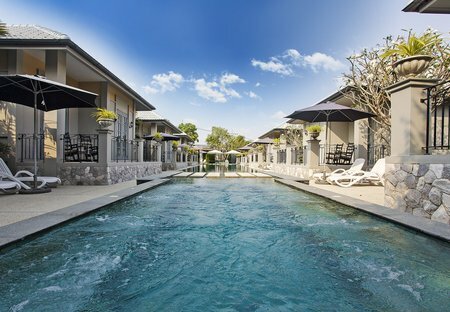 With five bedrooms, a private swimming pool and a comfortable interior, Baan Duan is a popular holiday villa with good reason. Modern stylish luxury immediately springs to mind at the 5 en-suite bedroom Angels Villa. Located just one kilometer from the gorgeous Jomtien Beach in Pattaya, the four-bedroom Sunny Villa is the ideal holiday home for families or groups of friends. Situated on a quiet side-street on Pratumnak Hill, just 600 meters from the beach, this modern four-bedroom villa is incredibly convenient, in a prime position between Jomtien and Pattaya. This modern tropical five-bedroom house at Jomtein is the holiday home of your dreams. If you are looking for a quality family villa near to Jomtien Beach, this is the perfect option for you. Located in one of the most convenient locations of all, just 1. Baan Phailin is the ultimate villa of choice for families or groups desiring a tropical Pattaya getaway. Within minutes of the world-famous Jomtien Beach, Baan Kinaree will be the luxurious five-bedroom holiday home of your dreams. Jomtien Summertime Villa A is located in a peaceful residential development just 1km from Jomtien Beach, coming equipped with four bedrooms and a tropical garden with a 32sqm swimming pool.